Young players often have to learn things the hard way when acclimating themselves to life in the NHL, and for the Edmonton Oilers this season, the lessons have been aplenty. A couple of weeks ago, the Oilers found themselves in the running for a playoff spot, something this franchise hasn’t been a part of in years, and something that was certainly uncharted territory for the core of this team. 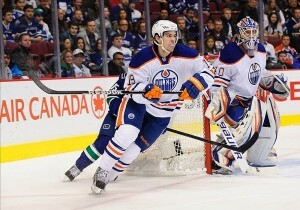 The Oilers had won five games in a row and were flirting with the eighth and final spot in the Western Conference. But since a monster 8-2 win over the Calgary Flames on April 3rd, the Oil have lost four straight and find themselves stuck in 12th place, six points behind the Red Wings who currently hold the final postseason spot. The three teams ahead of them are all tied with 43 points, making the prospect of jumping into contention, with eight games to go, a tall task. But the team hasn’t been mathematically eliminated yet, and the players are going into the final stretch with the same goal that they’ve had all season: make the playoffs. Tonight, they face Calgary once again, the final installment of the battle of Alberta for this season. As tough as things have been in Edmonton, it’s been much worse for the Flames. They recently traded their franchise player Jarome Iginla, face the prospect of their star goalie Mikka Kiprusoff retiring, and don’t have a lot of young studs coming through the system. But the concept of rebuilding is way of life for the Oilers, so there certainly isn’t much sympathy for their provincial rivals. Edmonton has struggled to generate offense five on five this season, which is surprising considering the talent this roster has, and rely heavily on their powerplay. But that too has been weak lately, and something they will have to sort out if they want to snap their recent losing skid. Over the past four games the Oilers have only mustered three goals, and that’s not going to win you many games in their league. The goaltending has been solid this season, which is a pleasant surprise, but they’ll need a lot more help up front, which they simply don’t get on a consistent basis. The Oilers remaining schedule after tonight is a difficult one, including two games each against the Ducks and Wild, and one each versus the Blackhawks, Canucks and Avalanche. And they’ll have to carry on without forward Ales Hemsky who is battling a foot injury. It’s amazing how quickly a team’s fortunes can turn around, a winning streak followed by a losing streak that has put that elusive playoff spot in jeopardy. But the Oilers aren’t looking beyond tonight’s game. The Flames are five points behind the Oilers in the standings, and won’t have a hard time getting up for a game against their biggest rival. “There’s always a little added juice to these games.” – Flames forward Mike Cammalleri. The Oilers playoff run has been a great story in the past few weeks. There were expectations upon this team because of the firepower they boast, and the continual young talent coming through the pipeline. But it’s been a process. With a rookie coach and a young line-up, the Oilers have experienced their share of ups and downs. The postseason may not be realistic, but to their credit the team is not letting math get in the way of how they’re playing. Being a part of meaningful games down the stretch is one of the best learning experiences a young player can have, and after a few dismal seasons in a row, there really is nowhere to go but up.